It seemed like earlier this summer, there were lots of CSN giveaways floating around the blogosphere. My mother had been talking about how I desperately needed more shelf space, so I entered, knowing victory was unlikely, but persevering nonetheless. I finally one won from Emma of Booking Through 365 (to whom I am now eternally grateful) and was quick to purchase myself a bookshelf. Once I ordered the bookshelf my order was expediently processed and shipped. Unfortunately, the box weighed upwards of 30 pounds when it arrived (oh hey real wood) so I had to get my family to help me lug it around once it arrived. No, I do not have any upper body strength. At any rate, I live in a two house situation and spend much more time in one house than another. 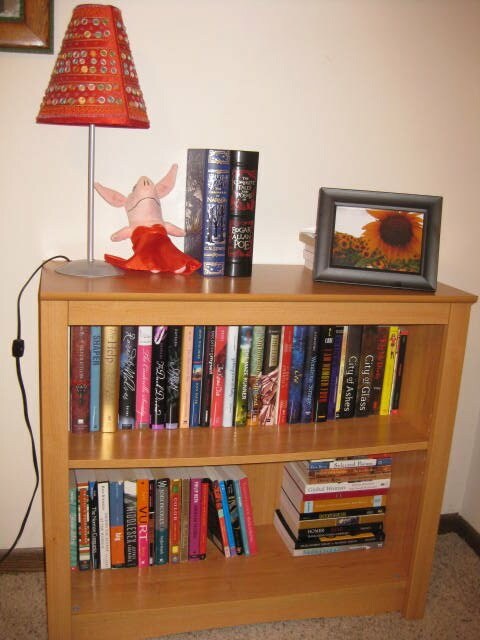 I've assembled this bookshelf in the house where I spend less time and moved some of my books there. I try and put books I've already read there, or books that look like good weekend/holiday reads as that's when I'm often there, but at the end of the day I kind of decided what to put over there arbitrarily. Sometimes I get frustrated because a book I want and I are not in the same place, but in retrospect that is a white whine and I could have much worse problems, as frustrating as that one can be. 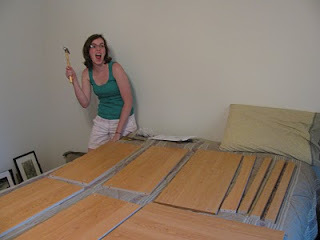 Assembling the bookshelf wasn't too challenging of task. Once I unpacked all of the pieces, spread them all out and took a good look at the directions it was pretty straightforward. All you need to put this together is a hammer, a flat head screwdriver and Philips head screw driver, so it doesn't require complex tools. I probably could have done this all by myself, but there were a couple of points where I made my mother come hold things in place while I hammered and screwed, just because it was easier. You'll notice that there are three long, slim boards which are part of the bookshelf, running just under the top shelf and along the sides. Those were a pain to get in place! I wound up covering them with a dishtowel and hammering that way so I could get them into place without damaging the wood. Once I got the bookshelf up it proved to be amazingly sturdy. 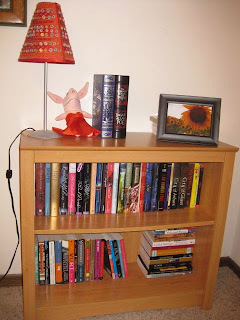 I was a little concerned that this one might be too small for my tastes, and while I still dream about having my very own Beauty and the Beast library, this bookshelf is not only spacious but the perfect size for the room where I've put it. I really enjoyed organizing all of the books I put it on it and deciding exactly where they should go. Overall, I love this shelf. Thank you Emma and CSN for making me a very happy camper and giving some of my books a place to live! That picture is just... epic.